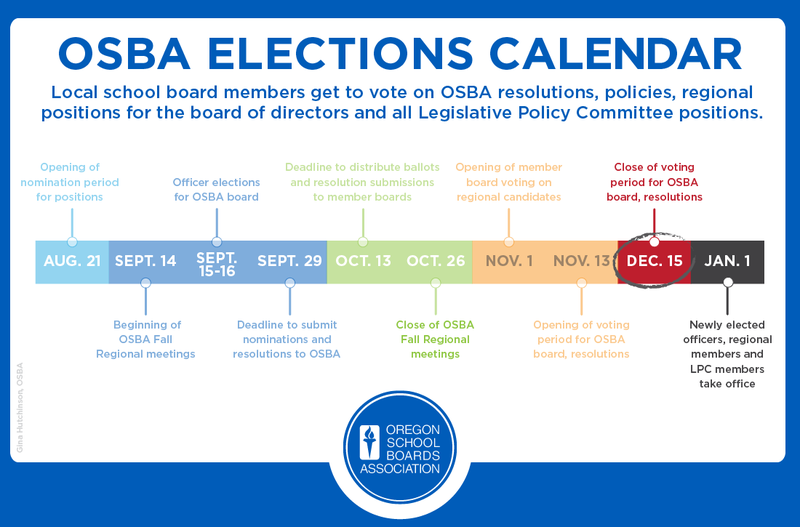 School boards have until Dec. 15 to submit their ballots for the OSBA election. Boards must take an official board action to cast their vote, though, so meetings must be scheduled before then. Official ballots by region include choices for the Board of Directors and the Legislative Policy Committee and a resolution on OSBA reorganizing as a nonprofit. OSBA is seeking to clarify its legal status while ensuring it can continue its legislative advocacy and tax-exempt status. For most members, OSBA becoming a nonprofit would have little effect, but it would mean that charter schools will no longer be allowed to join OSBA as associate members. Charter schools would still be able to receive services by working through their sponsoring districts. For more information, email info@osba.org.